Well what a year 2011 has been. We have had periods of being very busy and of being quiet during 2011. We have kept moving forward with this new website and blog which has been a big step for us from our old static website. We have tried to offer more than just a few images of sheet metal work and sheet metal machines and include more detailed information on processes and tooling as well as data to help you when designing new sheet metal components. The inclusion of video on the website has been mentioned by several customers as of interest as they are too far from us to pop in and see for themselves what we do. We have also not stopped investing in V and F Sheet Metal, we have added a second brand new Trumpf 7036 CNC press brake this year to go with the new one we installed in May 2010. They are both proving to be a good move as they have both enabled us to turn sheet metal work with bent features around quicker for customers with their shorter set up times over our older machines. Looking forward to 2012 I can see that we will continue to keep up to date with the latest software to enable us to maintain communication with our customers and ensure we have the most efficient nesting software for laying out sheet metal CNC punching. 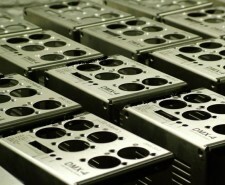 We continue to invest in new tooling to maintain the quality of the CNC punched and CNC bent components we are producing. What will happen to the markets in the UK and Europe is beyond our ability to influence but what we can do is to keep ourselves as flexible and responsive to our customers needs as possible and be ready for whatever they throw at us. Have a Merry Christmas and hopefully a prosperous 2012. 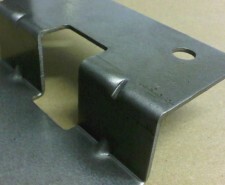 These sheet metal brackets have had the U shaped section formed on a hydraulic fly press with simple fly press tooling. They have been manufactured from 1.5mm CR4, mild steel, by CNC punching the holes and outer profile and then by CNC bending them to create a square cornered U shape. This component has then been formed in fly press tooling to create the curved U shaped section in the middle of the bracket. The tooling was made in a few hours and didn’t cost very much making this form of production ideal of small batches of work, proving prototypes and special bespoke projects. V and F Sheet Metal’s ability to turn our hand to such a range of sheet metal work gives our customers a great advantage when it comes to new design projects. We rarely say no to our customers ideas and usually only to suggest where a change can be made to improve the design to make it easier for manufacturing. There are plenty of examples of sheet metal projects within these blog posts and throughout the website plant and gallery pages that illustrate our versatility, please take a look. 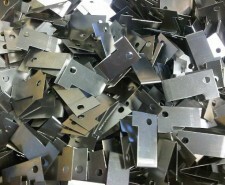 These sheet metal brackets are typical of the small components that we manufacture every day of the week. CNC punched from mild steel sheet, de-burred and then CNC bent these little sheet metal brackets are manufactured in batches of 100 at a time. The formed curve on the end of the bracket has been produced in our Trumpf 7036 CNC press brakes. If we have a standard form tool we will always use it to keep the production time down helping to reduce price. Sometimes we will not have a form tool to hand and we can then construct one if the volumes are large enough of the batches repeat often enough. If this is not the case then CNC multi-bending can be used to create the curved form in the sheet metal bracket by producing a series of small bends simulating a curve. 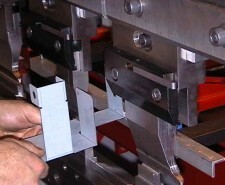 This CNC bending technique is also used to produce complex curves with varying profiles e.g. an ellipse. 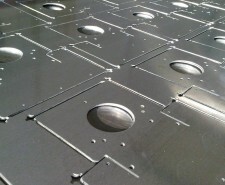 Sheet metal aluminium sections such as these shown here are often manufactured here at V and F Sheet Metal using CNC punching and CNC bending techniques. A component like this can be programmed for CNC bending in 5-10 minutes on our Trumpf 7036 CNC press brakes. When we are bending sheet metal work like this even though we can create the whole program off line if we want to or at the shop floor controller on the press brake we still have to manufacture 1 and test it first. The material gauge can change from batch to batch within its tolerance, the hardness of the material and the grain direction all go to create a variance in the bending even with the same bending CNC program. We cope with this by using program corrections, we bend 1 component and inspect the result to drawing and then make corrections to the CNC program. We only have to tell the CNC press brake how far it’s out and the software automatically adjusts the bend angles and then normally that’s it we are ready to bend all the parts the same size as the drawing. If you have a sheet metal work projects which needs CNC bending and you are not sure what can be achieved please give us a call on 01489 577786 or check out our bending tooling tables for more information. Brackets can come in so many forms to satisfy different engineering needs. They may be manufactured from sheet metal as these brackets have been by CNC punching from 3mm thick mild steel (CR4) sheet and then CNC bent to size. They can be cut from angle or channel section, cast or forged depending on the volumes required and the job the bracket has to do. For us the most flexible way to manufacture a bracket is to CNC punch them and then bend as we have total control of the bracket thickness, material type, bend lengths, bend angles and hole sizes. 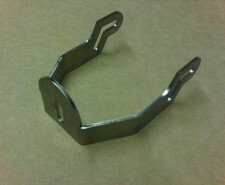 We manufacture brackets for a vast range of companies with many different uses e.g. lighting lamp holders, pump tray mounting brackets, speaker cabinet hanging point angle brackets, heater unit wall mounting brackets, you name it and we make it when it comes to brackets. If you have a sheet metal design that needs brackets manufacturing please give us a call on 01489 577786 and we will be happy to discuss your project with any price options you may want. We all know that CNC punch presses are good at punching holes very quickly in any sheet metal material. If you are looking for sheet metal work with circular holes or square and rectangular cut-outs created by punching several over lapping tools then you can’t do better. And again if you have a component that has straight sides to its outer profile you can’t go wrong with CNC punching. I often have customers say to me that they will have to have a sheet metal component laser cut because it has a larger circular hole in it or it has a curved outer profile which is not true. We can produce components with large circular holes and part curves with very few hits using CNC banana tools. The banana tools can be made to the exact radius needed or often we have similar sized banana tools that can approximate the radius needed. By indexing the CNC banana tool as it’s punching in our Trumpf CNC punch presses we can create a continual smooth curve. It’s always worth asking when you are designing a new component with internal or external curves to see whether we can CNC punch it for you. HBR2GJYJ3GZN We recently manufactured the sheet metal housings for some exterior under canopy lights installed in the Georgian building. These lights are installed outside but normally protected from the worst of the weather by being protected under a rook or canopy such as a shopping walk way or in this instance under a roof overhang. In this instance they have been used to great effect as an accent to highlight the building rather than for the amount of floodlighting that can be achieved. The effect can be dramatic, enhanced by the “Top Gear” style filtering on the camera lens. The sheet metal housings are normally manufactured from 304 grade stainless steel and powder coated or at least zinc plated mild steel sheet metal with a powder coated finish. As the components are used outside they normally have front glasses fitted with gaskets to keep the lamps dry. 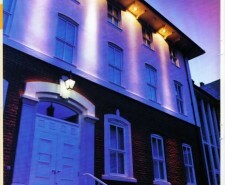 For more information on these lights and other lighting projects please give us a call. These stainless steel sheet metal garden light fittings have recently been featured in a show garden design at the 2011 Hampton Court Palace flower show. Working with our lighting fittings customer we manufactured for them bespoke stainless steel sheet metal components that were CNC punched, CNC bent,Tig welded together and then hand polished to a very high quality. These images of stainless steel sheet metal illuminated flower planters and illuminated stepping stone pavers really show off the versatility of the products that can be manufactured from sheet metal. 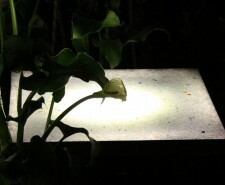 These fabricated products were made as samples to show off the range of materials that can be used in a garden and how they can change by being illuminated at night. 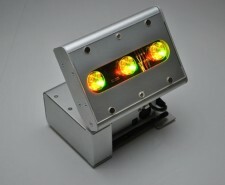 They are available as standard lighting products or to bespoke order. Stainless steel is an ideal material for fabricated sheet metal products that will be used outdoors if a clean easy maintenance finish needs to be achieved. Mild steel is however idea if left untreated by either zinc or paint if a more weathered and natural image is required. The polished stainless steel was used as a mirror inside a plastic shell to reflect the LED lighting outwards and produce this eery night time glow. 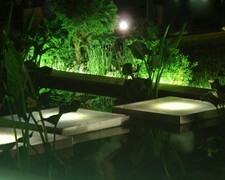 The planters had a natural beauty by day time without the LED lighting. V and F Sheet Metal, Fareham, Hampshire, UK. 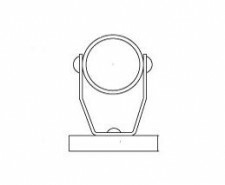 Stainless spring steel clips are used to hold a light fitting in place in an aluminium casting. 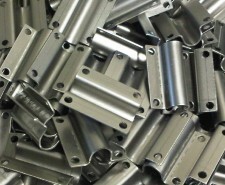 These stainless steel spring clips have been manufactured from 0.4mm thick stainless steel coil. 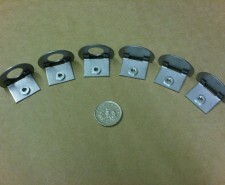 These spring clips have been guillotined, pierced by fly-presses, notched and bent on fly-presses. Typical batch sizes are from 100 to 1000 off although other volumes can be produced to suit your own needs. This type of manual sheet metal work complements perfectly the more complex CNC produced sheet metal work that we are better known for at V and F Sheet Metal. Aluminium, brass, copper, galvanised steel, mild steel, stainless steel, tin plate and Zintec from just a few mm across up to 2.5M in length. The range of thicknesses that can be bent varies with the tensile strength of the material being bent but between 0.4mm and 10mm is a range that we deal with every week. 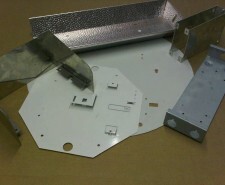 For more specific details please call us and we can advise you on your sheet metal design project. V and F Sheet Metal Company Ltd, 28 Brunel Way, Segensworth East, Fareham, Hampshire, PO15 5SD. Aluminium sheet from 0.4mm thick pre-anodised reflector aluminium up to 10mm thick aluminium bar. Brass sheet from 0.7mm thick up to 3mm thick. Copper sheet from 0.7mm thick up to 3mm thick. Galvanised steel sheet from 0.7mm thick up to 3mm thick. Mild steel sheet from 0.7mm thick up to 4mm thick. Stainless steel sheet from 0.7mm thick up to 3mm thick. Tin plate sheet from 0.4mm thick upwards. Zintec sheet from 0.7mm thick up to 3mm thick. Materials over these thicknesses can sometimes be laser cut, please ask for more details on your specific design needs. We can CNC punch sheet metal work from tiny items just a few mm across to sheet metal profiles 2.5M long with a vast array of holes profiles, forms and threads details. I thought it would be useful to explain in a little more detail the processes we go though as a sheet metal fabrication company when taking information from our customers and producing sheet metal fabrications by CNC punching on our Trumpf CNC punch presses. The whole process can be broken down into 10 basic stages from receiving the basic design information from our customers to the final CNC punched components. The design information we receive from our customers can be in many forms but the most common are 3D STEP files, 3D SAT files, 2D DWG and DXF drawings, simple PDF files or still occasionally printed paper drawings. Sometimes our customers will be give us a sample sheet metal component to copy or adapt to their specific needs on a particular project. Most of the time if the sheet metal fabrication is not just a simple flat component we will create a 3D model as the starting datum for the project. This enables us to examine the assembly fit of several associated sheet metal components that might have to work together for instance a sheet metal folded box and a cover where the fixing holes need to line up. We can feed this design information back to our customers to be checked out with their non sheet metal parts before we start any actual manufacturing. This can also be a help for our customers in checking their own designs and we can at this stage feedback possible design improvements to help with production and reducing the sheet metal component price. The 3D software model of the sheet metal component is used to create an ‘unfolded’ developed flat blank of the part. At this stage all the manufacturing information such as material type, sheet density, sheet thickness and corner bend radii will have to be correctly applied to the sheet metal component model to create the correct bend sizes. Once done correctly this will enable a sheet metal component to be CNC bent and to fold up back to the correct sizes to match the original 3D design model. This has a great advantage for us as do not have to try out sample sheet metal parts before batch production of sheet metal work as all the trial and errors can be carried out within the software, thereby saving material costs and time. The next stage is to refine any corner notches that will not fit standard CNC tooling, check that all the details on each face of the box are correct to the 3D model and add any required inspection information that might be needed to the manufacturing processes for the sheet metal fabrication. The Radan software we use can apply a standard CNC tool library that we have built us over many years to try and match features in the sheet metal component with the correct CNC tooling. 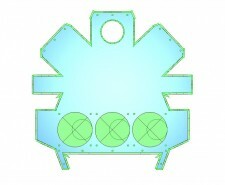 The library of existing parts can be seen on the website under the tooling sections. This is the stage where the skill of the CNC programmer is also required to ensure the correct CNC tooling is selected and the least number of hits is used to produce the most efficiently CNC punched part. This is also the stage where we have to decide how the sheet metal work will be removed from the parent metal sheet. It may be tagged at its corners and then removed by hand, CNC punched completely out of the sheet to be removed by hand or CNC punched out and allowed to drop through a chute in the bed of the Trumpf punch presses into a collecting bin below. This method is usually best applied for small sheet metal parts that may not have an important cosmetic surface finish. There is a video link of our Trumpf 3000R CNC punching some mild steel bracket through the machine chute straight into a bin below. Our Radan CAD/CAM software nester utility is then used to find the best fit of the parts from a given sheet of metal. Odd shaped parts can be fitted together and smaller parts CNC punched from the gaps between larger sheet metal parts or even from within another part’s window features. The better the fit that we can achieve at this stage the higher the sheet metal material yield the cheaper the final part price will become. This has become all the more important with more expensive materials such as stainless steel, aluminium alloys and brass or thicker sheet materials. With the Trumpf CNC punch presses we can program to produce sheet metal work from between the machine clamps enabling still more components to be squeezed from each sheet of metal. The software is also used to check that all the CNC tools and individual sheet metal components are not overlapping each other. It is also very important that the CNC nested metal sheet is stable enough in production to hold together whilst being CNC punched at speed on our Trumpf punch press machines. The exact order that the individual CNC tools are punched into the sheet metal can be controlled which is important if you have forms in the sheet metal fabrication such as dimples, louvres, tapped plunged etc as they need to be CNC punched after any other holes or they will be damaged by the head of the Trumpf machine moving over them. This stage of the CNC programming allows us to see within the CAD/CAM software what the Trumpf CNC punch presses will do when the sheet metal is being punched. At this stage any strange movements of the parent sheet metal can be corrected to give the most efficient and the safest punching path is production. The ‘blocks’ are automatically written as the code needed to talk to the Trumpf CNC punch presses to instruct them when to punch, which CNC tooling to use, the sequence that the CNC tooling is used in and where to punch on the metal sheet. This code should need no alteration by us as Radan automatically writes this code based on the order text written in step 7. The final part after CNC punching, de-burring and CNC bending. The sheet metal work is now finished. For more information on sheet metal work and how it’s made please take a look at this in depth review. 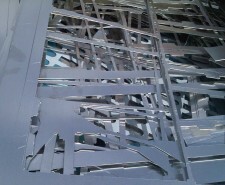 We are always looking for new and interesting examples of the applications that our customers use sheet metal for. Here’s an unusual application for sheet metal in a medieval church nave. We have manufactured sheet metal fabricated housings for one of our customers from aluminium sheet which have been CNC punched out using our Trumpf 200R CNC punch press, rolled up side panels to create the curved body effect and then Tig welded together to form a fabricated assembly. After we have cleaned up all the welded joints the sheet metal housings are powder coated white. 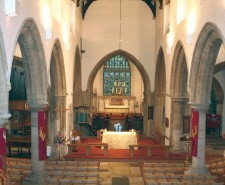 As you can see from the images in this church the light fittings provide mainly up light output but also a down light component through a sheet metal slatted louvre grille which is very effective at night time. What’s strange to think is that when the church was originally built there would have been no electric light fittings, CNC machined work, aluminium or powder coating. I wonder if these fittings will still be in place 800 years from now? The lighting effect is quite different from the original medieval church being just illuminated by candles! When we are manufacturing sheet metal brackets sometimes a customer will want a stronger bend than can be achieved from the parent metal. Their options are to have the material gauge increased which may not be possible if there are space or weight restrictions. The tensile strength of the sheet metal may be increased but this will normally mean a different material quite often a more expensive material which may not be suitable. Some designs can be reinforced by the use of welded gussets but again there can be space and cost implications in this solution. The simplest and cheapest option is to CNC bend the sheet metal component with a stiffening form. This form is simple part of the bend that is not complete and is achieved by having a gap in the CNC bending blade and a point below deforming the sheet metal during the standard bending process. The cost is minimal, only a little extra set up time and there are no extra material costs or special processes after the bend to achieve increased strength. Whenever possible we will CNC punch out the sheet metal components that we need to satisfy our customer’s sheet metal requirements. However there are occasions when perhaps a component is just too thick to CNC punch out successfully and a laser cut profile is more efficiently produced. For us this point is reached at thicknesses of 3mm in stainless steel, 4mm mild steel and 5mm in aluminium alloys. There is another application that sometimes favours using a CNC laser cutter over a CNC punch press and that’s a sheet metal component which has very complex cut-outs or an outer edge profile that cannot easily be CNC punched with standard tooling. 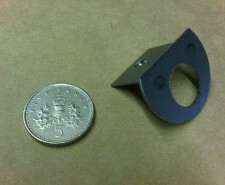 This little stainless steel bracket doesn’t fall into either of these categories but we did opt to have it laser cut. The main reason being that the bracket was in stainless steel and the slots did not coincide with any standard tooling we held for our Trumpf CNC punch presses. As the order was only for a small quantity it was easier and cheaper to have them laser cut rather than organise special tooling. If the quantities increase in the future then the CNC punching route will be the way to go with this little stainless steel bracket. Again, this just shows the range of internal services and network of sub-contracts operations that V&F Sheet Metal can bring together to support you when you need sheet metal manufacturing in whatever form or volumes that it might take. 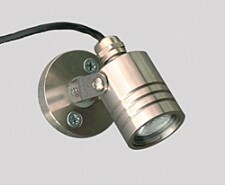 Here’s a clever idea, an LED light fitting that doesn’t need to be plugged into the mains to produce light. This little LED light fitting has its own battery pack enabling it to be used anywhere without the worry of trailing power leads. The clever part comes in the fact that it can be controlled remotely (WiFi) so a PC can be used to create changing light moods within a room. 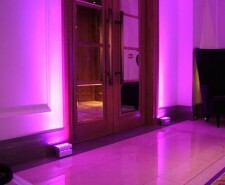 This type of light fitting lends itself to special events e.g. wedding receptions or parties where cabling would be impossible and then the whole setup can be removed or changed for another event. We have produced all the sheet metal work in aluminium to produce a lighter product and aid with the dissipation of heat within the fitting. The actual stages of the 3D development along with the 2D CNC punched parts their CNC punched nest and the final fabrications can be seen on our webpage sheet metal fabrication assembly. We have just added a new gallery web page of examples of sheet metal components and assemblies we have developed using radan 3D software to create their 2D developed blanks with CNC tooling in place. 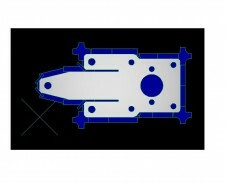 Please take a look at http://www.vandf.co.uk/sheet-metal-cnc-tooled-parts/ for more examples or http://www.vandf.co.uk/software/radan-software/ for more information on Radan software. We have just added a new gallery web page of examples of sheet metal components and assemblies we have developed using radan 3D software. The 3D images show how single sheet metal components and sheet metal assemblies can be used to develop the correct flat pattern blank which can then be CNC punched and CNC bent to produce the final parts. 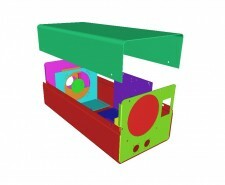 Please take a look at http://www.vandf.co.uk/sheet-metal-3d-software-models/ for more examples or http://www.vandf.co.uk/software/radan-software/ for more information on Radan software. We have just added a new gallery web page to our website illustrating a range of sheet metal components with various sheet metal inserts and their applications. 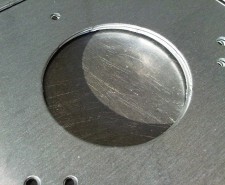 Please take a look at http://www.vandf.co.uk/gallery-sheet-metal-inserts/ for more information. The lighting industry has its own particular requirements when it comes to the sheet metal materials that are commonly used. These materials may be special polished and pre-anodised reflector sheet aluminium used to either concentrate a field of light into a focused beam or to spread a light pattern over a large area with no obvious cut off shadow line. Having worked on many lighting projects over the last 3 decades we can aid you with your selection of reflector materials and hold many standard sheet metal types in stock. We also manufacture sheet metal work specifically for the lighting industry using a range of pre-painted mild steels for the fabrication of 2D gear trays, T5 and T8 fluorescent battens from 0.5mm thick and price sensitive reflectors. These sheet metal components have the advantage of reducing the total project lead time and quite often the cost of each fabricated lighting component. We always have a wide range of zintec in industry standard gauges which you can specify for many lighting components including lighting control gear boxes, chassis components, clamping brackets and as a good base material for external powder coated components e.g. under canopy light fittings. Having manufactured sheet metal work for UK based lighting companies since the early 1980s we have built up a vast range of CNC tooling which is ideally suited to manufacturing sheet metal parts without tooling costs. Initially we worked with local companies near to us in Fareham, Portsmouth and Southampton in Hampshire but as time has gone on we now supply sheet metal fabrications to lighting companies across the UK. 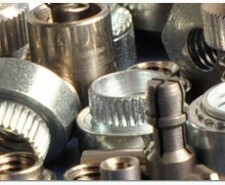 Our CNC tooling library includes tooling for lamp holders, electrical conduit knock outs, banana tools to cut out 2D circular gear trays, taptite form tooling to form self tapping threads to eliminate masking when powder coating sheet metal work as well as all the standard slot and holes sizes you could need. 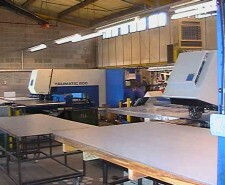 For a better idea please take a look at our CNC punch press tooling tables. It’s not just about having the correct CNC tooling but the experience of manufacturing hundreds of lighting projects which enables us to offer you free advice when it comes to which sheet metal material to choose, the best type of corner joints to stop light leak, the most appropriate fixings etc, these all equate to a real added value service for you when starting out on the design of a new light fitting needing to employ sheet metal fabrications. CNC Punching corner rads and holes with banana tools in sheet metal components is simple with a Trumpf CNC punching machine. We have a range of CNC punching corner radius tools and banana tools which can be seen on our 2D standard tooling pages. The photos here show a corner radius tool with R2, R3, R4 and R5 corners all built into one CNC tool. The ability of the Trumpf CNC punch presses to rotate any CNC tool through 360 degrees mean that these tools can be rotated instantly to the correct position ready to punch a corner radius on any sheet metal component required. The same concept and be applied to a banana tool. This style of CNC punch tool can be rotated in the Trumpf punching head and indexed as the circular hole is punched. The inner scrap piece of metal can then be dropped straight down the machine chute in the bed of the punch press and into a collecting bin below thereby removing the risk of it damaging the sheet metal surface. 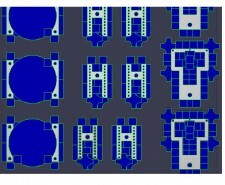 These features are just a small illustration of the range of manufacturing techniques we can apply to CNC punching sheet metal work with our Trumpf CNC punch presses. There maybe many components that you are not sure can be manufactured or are having produced now that we can improve for you, please give us a call on 01489 577786 to discuss your sheet metal work designs. 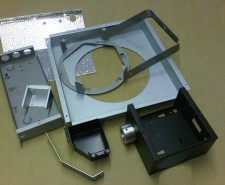 Aluminium electronics enclosures such as the type shown here are often being manufactured in our workshops. These particular sheet metal enclosures are for a lighting control project and are manufactured in batches of 25-50 at a time. Although they can seem quite simple they usually employ many of the main manufacturing areas that we specialize in namely, CNC punching, sheet metal edge de-burring, CNC bending, counter-sinking and bush, stud or stand-off insertion. These sheet metal enclosures need to have a clean and scratch free cosmetic outer surface. This can be achieved by using aluminium sheet metal with a peelable plastic film to help protect the soft aluminium surface from scratches during CNC punching and movement within the workshop. To prevent CNC bending block tool marks on the outer face of the enclosures we use a heavy plastic film which helps to shield the sheet metal surface from the pressure points on the die block. All these techniques help to present a clean and attractive component to the final user of the product. 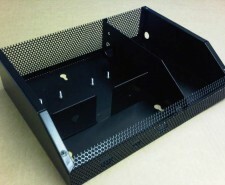 With these particular electronics enclosures after they have been manufactured they are silver anodised and silk screened before being assembled. If you have any aluminium sheet metal enclosures that you are lookng to purchase please send us your current drawings or a sample and we will produce a free quote for you. Mild steel sheet metal brackets such as these shown here are typical of the sheet metal work that we are manufacturing every week of the year. They suit perfectly the manufacturing capacity that we have in CNC punching and CNC bending. 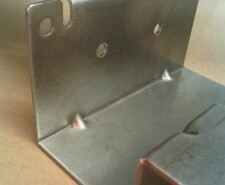 Along with de-burring and bush insertion these brackets can be produced very quickly before being zinc plated. This particular bracket is part of a sheet metal call off order which will last for several months with V&F Sheet metal stocking the brackets here in Fareham, Hampshire ready to be called in monthly by our customer. The 3D model shows nicely how easy it is for us to generate the sheet metal bracket with all its physical details, material, gauge thickness and bend radii and then develop the true size blank. The blank is then taken and automatically tooled within the Radan software and then nested into a pattern that suits the best sized sheet for the sheet metal bracket and the batch volume being manufactured. 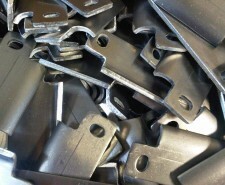 Spot welded sheet metal fabrications can come in all sizes from as large as sub assemblies for cars and lorrys down to tiny thin gauge assemlies such as these mild steel end caps. In this instance we have manufactured 2 mild steel end cap types, one with a hole and one without. 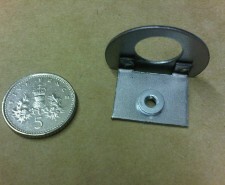 The end caps both have a small angle bracket spot welded into position with an M3 PEM bush inserted as a fixing point. The 2 basic sheet metal parts have been manufactured by CNC punching out their shape and holes and then CNC bending up the 90 degree angle. The M3 PEM bush was then inserted using our Haeger bush inserter and then the 2 parts were joined together by spot welding. The parts were alinged correctly with a small production jig enabling the spot weld tips to gain access to the 2 metal surfaces. 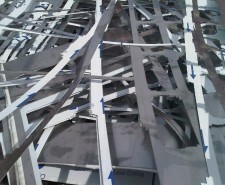 The final sheet metal fabrications were then checked and sent off to the customer where they were painted. Small sheet metal components and sheet metal fabrications such as the ones shown here are typical of the sheet metal work that V and F Sheet Metal specialise in and can be found manufacturing every week of the year from our factories in Fareham, Hampshire. These stainless steel chandelier housings are fabricated by CNC punching, rolling, CNC bending and welding. After basic cleaning up of the Tig welds the final cosmetic appearance is achieve through polishing. This installation was a bespoke design so needed a quick turnaround on manufacturing but also the minimum of time spent sorting out all the component part designs and production details. Whenever a special project needs manufacturing the sheet metal components need to be designed, developed and CNC programmed as quickly as possible so that the overall project price is kept to a minimum. Using Radan and Trumpf software we can achieve this quickly with the minimum time spent getting the job to the shop floor. 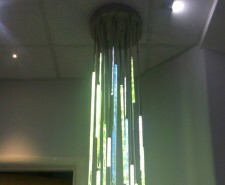 Special one off projects are just part of the services we offer to lighting companies in the UK. We help with their sheet metal fabrication designs, special projects, repeat batch work and volume production. If you have some sheet metal fabrications that you need a second opinion on or a target price that you need to get to then give us a call and let’s see if we can help you. 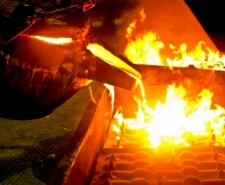 V and F Sheet Metal, supporting the Olympics – well sort of! 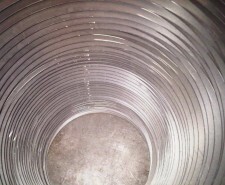 We manufacture a number of galvanised steel formed straps to help support air-conditioning ducting in buildings. The galavanised steel straps are CNC punched out of 2mx1m and 2.5m x 1.25m sheet metal, CNC bent and then formed around curved former jigs. Some of the smaller units have bends that are formed up on our Trumpf 3000 CNC punch press using multi-bend tooling. The sizes of strap range from under 100mm in diameter to over 1250mm and in gauges from 1.2mm thick to 3mm thick material. The galavanised steel straps are semi-circular in form and used in pairs to trap the galvanised ducting and suspended from the ceiling on steel drop rods or threaded studding. 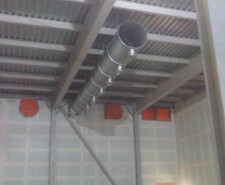 The picture here shows a partial installation for one of the new building for the Olympics media centre. Only a small sheet metal component but we are proud to have been involved with the 2012 Olympics project. 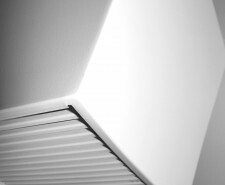 We have a range of other brackets and profile sections that we manufacture for the building trade such as wall cladding, roof brackets and ceiling adaptor plates and would be happy to talk with you if you have similar projects that you might require in sheet metal. I have just seen on the BBC website that the Somerset and Avon Police (over 300 officers) have raided scrap yards across their region looking for stolen goods including ferrous and non-ferrous scrap metal. With the global requirement for certain metals pushing the costs up and up for example copper at over £5,000 per tonne and lead at over £2,000 per tonne its very tempting for some people to help themselves. The police are saying that with man hole covers, roof lead on churches and schools, copper wiring from telecoms systems, railway signalling and thefts from industries scrap bins it could be millions or even billions of pounds per year that is going missing. We have to be very careful with our scrap and store it all indoors until we are ready for the scrap / recycling companies to come and collect the metals ready for processing. 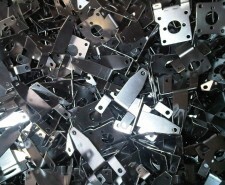 As a sheet metal manufacturing company the “waste” metals that we produce from our sheet metal guillotining and CNC punching manufacturing processes can all be recycled. We just have to be aware of the materials types that we are using to make our sheet metal work when saving them for recycling. We separate out the stainless steel, mild steel with zintec and galavanised steel, aluminium alloys, copper and brass into different bins ready for collecting. They are all collected and melted down with other scrap metals and prime material ores to produce more sheet metal or other metal items. You can see in the images here various sheet metal that has either been produced as waste material from CNC punching through the dies known as slugs. These slugs are collected as the CNC punch presses punch holes in the sheet metal with the slugs being sucked away under a vacuum system. 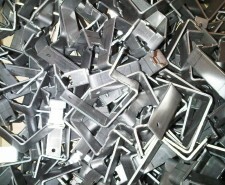 The CNC punched scrap frames is the material that is left around the sheet metal components that are CNC punched out. With our Trumpf CNC punch presses we will try and utilise as much of the sheet metal materialas possible to manitain a competitve piece part price but some material will do be used. 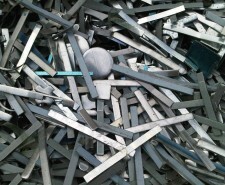 Again, this sheet metal scrap is collected into material types before recyling. I guess being able to recycle so much of our prime manufacturing materials makes use quite a green company. Getting too hot in bed? As with so many sheet metal work projects that we manufacture for our customers this little spot welded box is never seen by the people who finally use it. 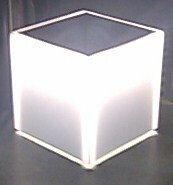 The black rectangle shown in this image is a sheet metal enclosure called a bed head light and is commonly used in hotel bed rooms. The sheet metal box is used to safely house a light source with a reflector which then transfers its light output through a fibre optic cable to the light source head. 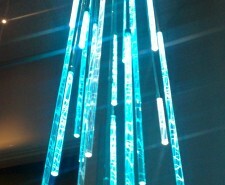 The advantage of fibre optic lighting is it’s a cold light source. 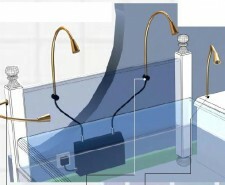 The hot lamp is housed within the sheet metal box and the light source without the heat is where you want it, in this case on the pages of a book. The sheet metal fabricated enclosure is made from CR4 mild steel and powder coated matt black to help conduct heat away from the enclosed light source. The same type of lighting systems can be used to illuminate painting, works of art or museum exhibitions where a hot light source could fade or dry out the exhibits. 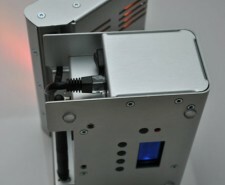 Again, the sheet metal enclosure that the light source is housed in is out of sight but not out of mind. 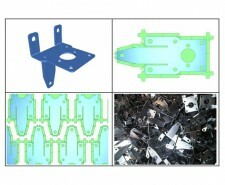 Small stainless steel sheet metal components, cnc punching. Here’s another great example of CNC punching small sheet metal components with our Trumpf CNC punch presses. You can see from the 5p coin included for scale the size of these little stainless steel sheet metal components, the thickness being 0.7mm in 304 stainless steel. 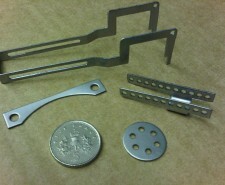 These parts are all for a new design project for medical equipment. They have been manufactured by CNC punching (Trumpf 3000), sheet metal edge de-burring and CNC bending (Trumpf 7036). These parts could have been CNC laser cut but we had all the correct CNC punching tooling so used this manufacturing method for speed of turn around. 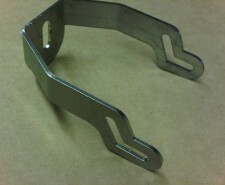 We had only days from receipt of the order to production of these new stainless steel components. 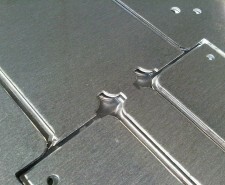 The parts were CNC programmed using Radan software, an image is shown here of some of the stainless steel components with their CNC punching tooling in place on the CNC punching nest. When sheet metal CNC punching projects like this become production items we will often look at evaluating the design for the most economical CNC punching method and tooling to save money and improve the quality of the final sheet metal components. The flexibility of CNC punching sheet metal work never ceases to amaze us from just a few mm to several thousands of mm long all from the same CNC punching machines. 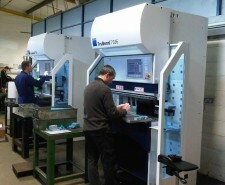 If you are ever in Hampshire please call in and see our sheet metal CNC punching technology in action. When a company have a range of light fittings which are imported from a low labour cost country such as China they may have an advantage of selling standard products in the UK at competitive prices. 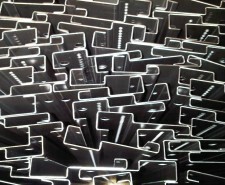 The problem they often encounter is that although suppliers from the Far East are happy to supply standard sheet metal products in large numbers they do not want to get involved with smaller batch sizes or special projects where particular design requirements may be specific to just one site or one product design. This is where we can help out, being UK based and with over 25 years of experience in the UK lighting industry we can often solve our customers sheet metal design problems and have the sheet metal work finished in just days. Often 3D models or samples may need to be evaluated before the production batch of sheet metal components can be completed, again being UK based means we are only an overnight delivery away from you and even quicker if you are based in or near our factories in Fareham, Hampshire. These light fittings shown here have a standard sheet metal fabricated fixing bracket which at times is not suitable for all standard installations. 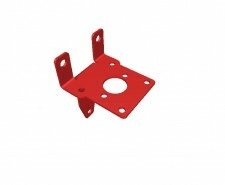 We can take the standard sheet metal bracket and modify it or manufacture a new sheet metal bracket maybe to a different size, material type or material gauge. If you have a project where you need to modify some standard sheet metal parts or use them as a starting point for your particular needs then please give us a call and let us see how we can help you.